You have decided to replace that missing tooth! You are certain that a removable denture is not the right solution for you! You found out that you want to go with an implant to replace the lost tooth but you don’t want metal parts inserted in your body! You are wondering if a METAL-FREE implant made of Zirconia ceramic would be a HEALTHIER possibility and would be a much better match for your natural teeth! You just want that tooth back without all the trouble caused by dentures and bridges – the feel should be as close to a natural tooth as possible. After the FDA approval last year, we now have a fourth option – METAL-FREE Zirconia implants. These have been used in Europe for over a decade. They boast excellent biocompatibility and stability. They may not be suitable in some cases, they are, however, an excellent and healthier option. HOLISTIC: for absolute metal-free dentistry Zirconia is the only viable choice. 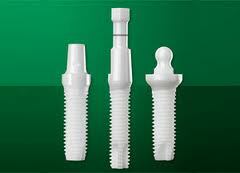 No longer is it necessary to implant Titanium or any other metal in order to have fixed teeth. 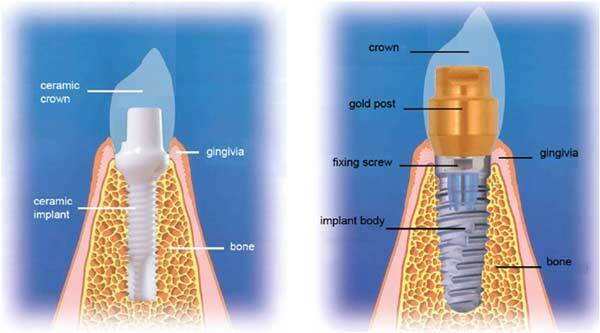 This illustration of Zirconia (left) and titanium (right) tooth implants clearly shows the simplicity of the Zirconia implant in comparison to the traditional metal implant. Simplicity is certainly a big advantage because the fewer the parts, the less can go wrong. One argument against metal in your body that most of us can relate to – have you ever accidentally bitten on a piece of aluminum foil? – If so, you know why you don’t want metals in your mouth! Or send us an email through our Contact Page.